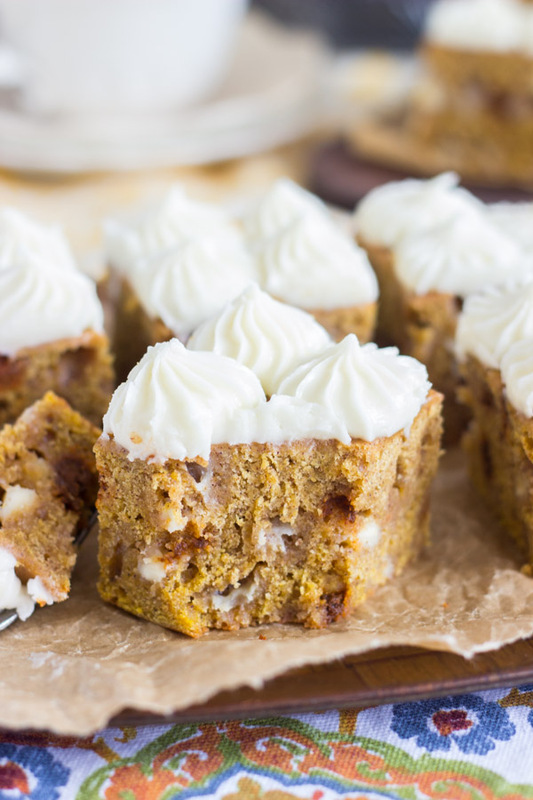 The thickest, chewiest, and most moist pumpkin blondies you will find. 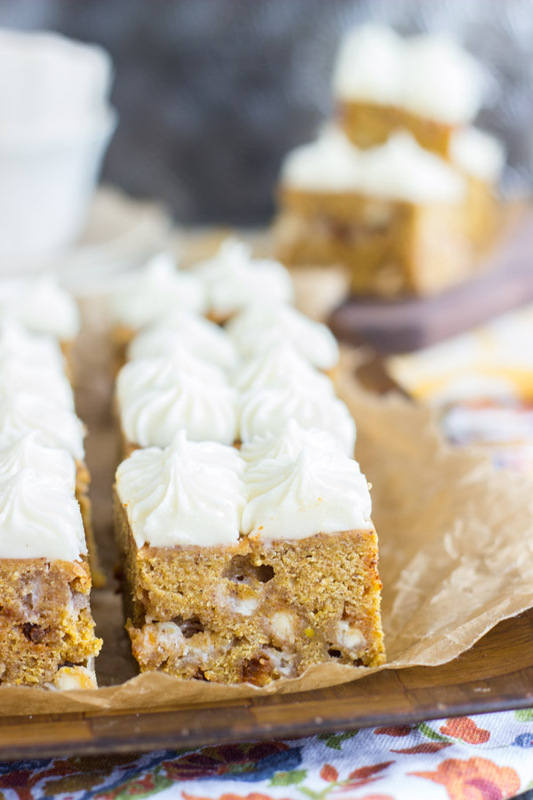 Full of pumpkin and spice, and loaded up with white chocolate and cinnamon chips! 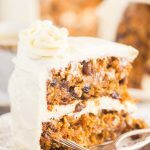 Topped with tangy cream cheese frosting! So the site got a sprucing up. Do you like it? Dig around, and let me know if you see anything that I ought to change. The redesign was not without hiccups. I’m so happy it’s done, and I hope not to do it again for a while. I really like how picture-focused it is! The recipe photos are front and center, and the site is light and bright. I wanted it to be less cluttered as well. I miss the gold foil background, but it was time for something different. I may bring it back on the site somewhere, in a small way. Anyhoo…. pumpkin stuff. Still on that for now. 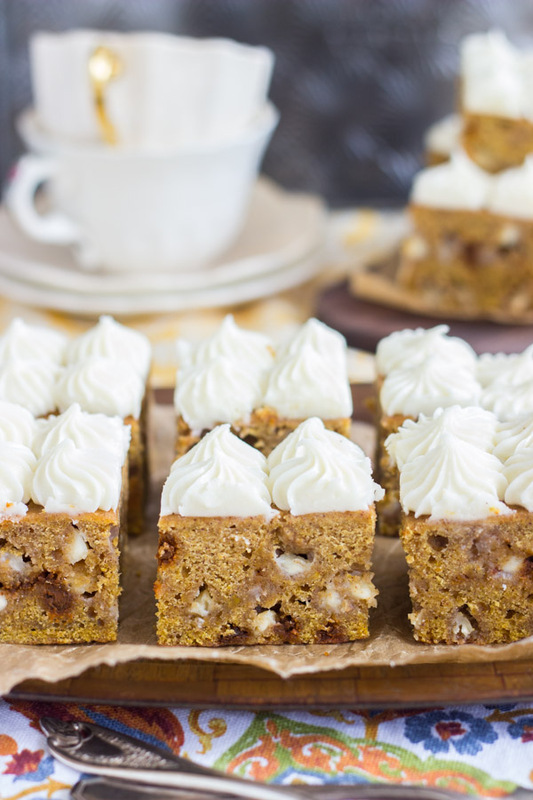 One of the reasons that these pumpkin blondies stand out from others is by their thickness. They’re really like an ultra-thick brownie in texture, but just without cocoa. Almost twice as thick as a regular brownie. Chewy the way a good fudgy brownie is, but maybe a little more structure and sturdiness. I added white chocolate chips to these because I’m obsessed with that combo. Obsessed! And I HATE that overused word! But it fits. 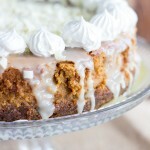 Since making this White Chocolate Pumpkin Cheesecake, I can’t get enough of pumpkin with white chocolate. Something about these blondies makes the white chocolate chips totally disappear when they bake, but I like them in there. It’s almost better that they disappear and melt away into the blondie. 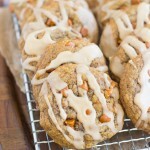 I also added cinnamon chips – I love those little nuggets. The best, if unoriginal, pairing with pumpkin is cream cheese, of course! 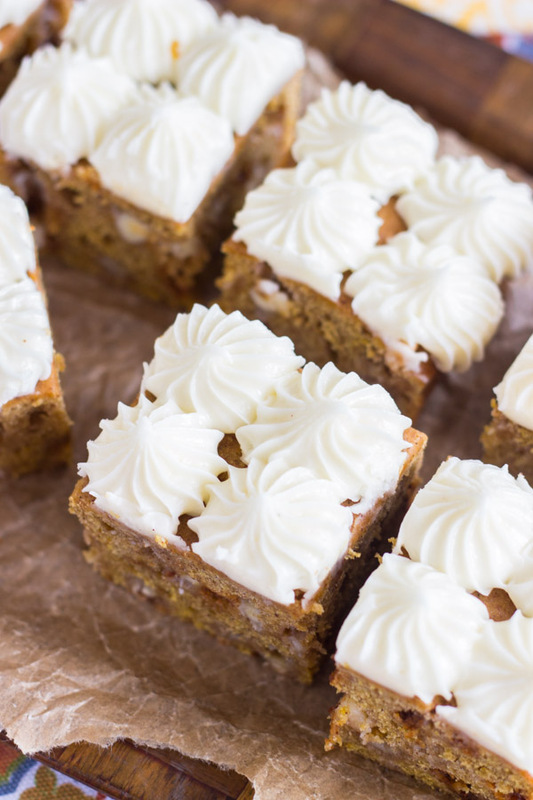 I topped them with cream cheese frosting, and I never tire of that stuff. It’s silky smooth and oh-so flavorful. 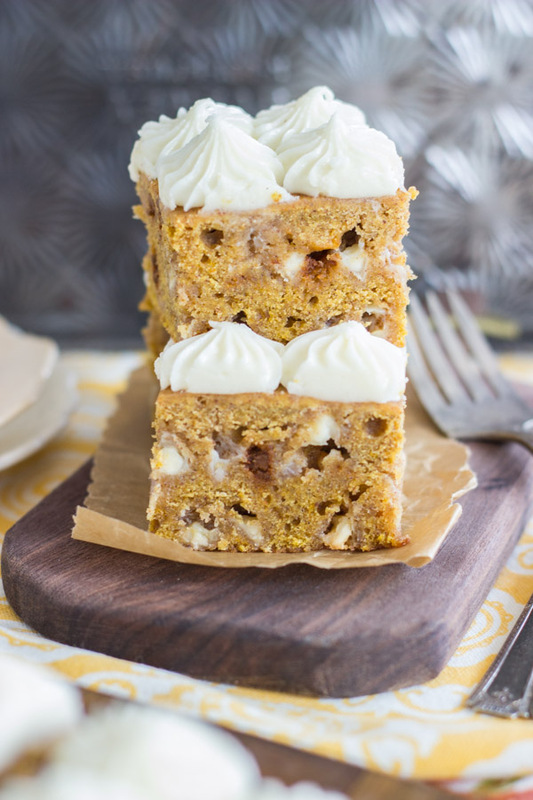 The sweetness and tang is so perfect with pumpkin and spice (and everything nice!). It’s important to find a good cream cheese frosting to keep in your recipe arsenal. 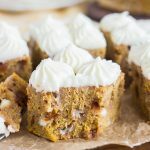 You need to make a big pan of these Pumpkin Blondies with Cream Cheese Frosting this fall, and they will be the last recipe for pumpkin blondies that you ever need! Beat in eggs, corn syrup, vanilla, and pumpkin. In a medium bowl, combine flour, pumpkin pie spice, ginger, clove, salt, and baking powder. Add to the mixing bowl, and beat until just combined. Fold in white chocolate chips and cinnamon chips. Pour batter into a greased or parchment paper-lined 9-inch square baking pan. 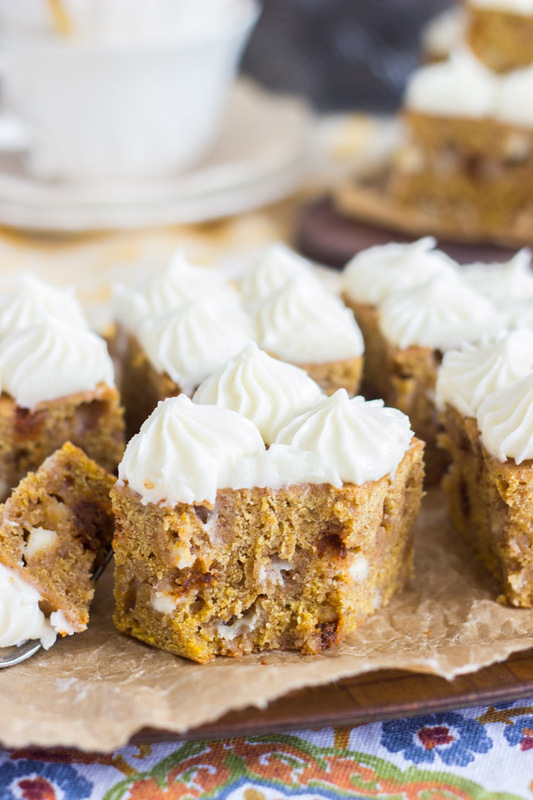 Frost the pumpkin blondies. Cut and serve. This will likely make extra cream cheese frosting. You can cut the recipe in half, if you'd like. I'm always fine with extra! 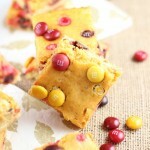 I LOVE blondies — they have the best texture! So dense and fudgy and I love how these are extra thick with just enough frosting. Beauties! I like dessert first!! Thanks for sharing on the What’s for Dinner Link up! Your “But first,Dessert ” slogan strikes me funny. Site looks great, but you still have that “unsubscribe” button. Get rid of that. Nobody wants to unsubscribe from you. 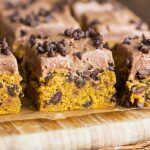 I love pumpkin…and brownies…and blondies. These should be WONDERFUL! I’ve added them to my PInterest board so I can come back and snag the recipe.